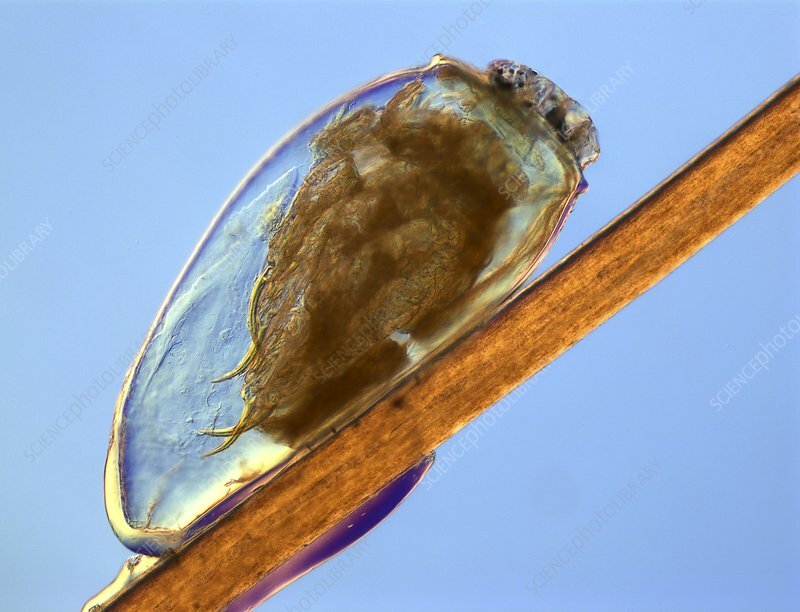 Light micrograph using differential interference contrast (DIC) of a nit (egg case) containing a developing human head louse Pediculus humanus capitis, attached to a human hair. The vase-like nit has a perforated lid (upper right), which is removed by the emerging nymph. Adult female lice lay between 80-100 eggs in a lifetime. Development to maturity is rapid, with successive generations arising at intervals of about three weeks. The adult lice live within the hair of the head. Infestations of Pediculus humanus capitus cause pediculosis, an intense itching that may progress to bacterial infection. Treatment is with shampoo preparations. Horizontal object size: 1.2 mm.